National Geographic is one of many sources reporting on an exciting new discovery of ritual objects in a cave beneath the Maya site of Chichen Itza in the northern Yucatan. The objects were found in a cave system called Balamku (Jaguar God). Caves had special importance for the Maya, who considered them passages to the underworld. Among the reasons for this is the geology of the Yucatan, with its limestone cenotes and extensive caverns. Until fairly recently, archaeologists saw caves as relatively minor adjuncts to the grand ceremonial structures that remain above ground. Now it is possible to image the cave system as equal in importance to the world above. Reports say the objects have been untouched for a thousand years, but I don’t know how that can be known for certain. We do know that archaeologist Víctor Segovia Pinto knew of the entrance to the caves and had it sealed up in 1966, for reasons that National Geographic implies are mysterious. So they have been untouched for more than fifty years anyway. There is an embedded video about the discovery in the National Geographic site (linked in the first paragraph above. Be warned it is prefaced by a long commercial, and the clock restarts if you scroll to read on. The image at the head of the post (which I took in 2007) is El Castillo, the central pyramid in the Chichen Itza complex, viewed from the Thousand Columns (which was a large covered space). The newly explored caves were within two miles of it. 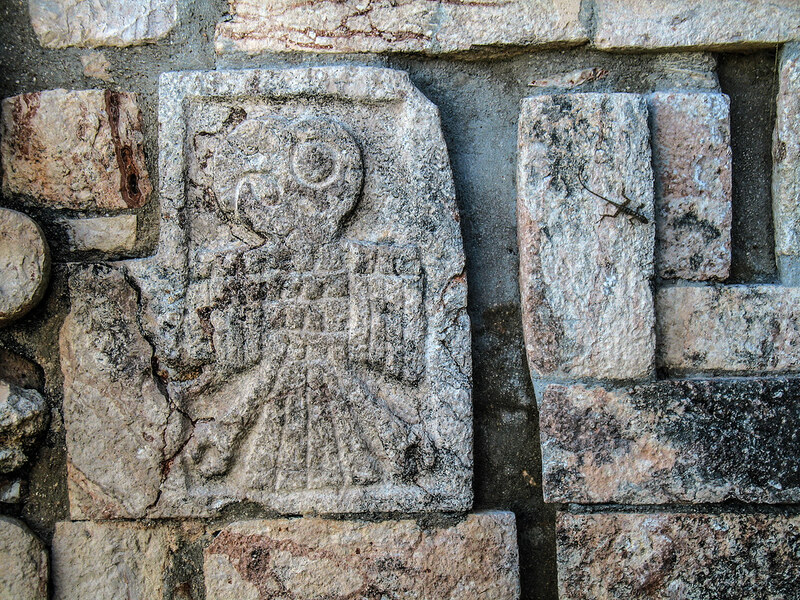 This parrot is carved in stone near the top of the Great Pyramid at the classic Maya site of Uxmal in the Yucatan. “Uxmal” means thrice-built, but archaeologists have uncovered at least five stages of construction. The Maya often constructed new pyramids on top of existing ones, and it is speculated that this pyramid, located in the southern part of the site, was being prepared for such a treatment when it was abandoned. Parrots — especially macaws, the largest members of the parrot family, which are native to Mexico and Central and South America — were associated with fire, and the sun, by the Maya because of their bright colors. Images of macaws appear in the Dresden and Madrid codices, in both cases bearing torches. The hero twins of the Popul Vuh trick the death gods by placing macaw feathers at the end of cigars to make them appear to be burning. In general in Mesocamerica fire represented the principle of change. For the Maya fire was a vehicle for for communicating with the gods. Offerings of bloody paper were burnt, the rising smoke viewed as carrying the people’s supplications heavenward. Named in Spanish El Caracol (the snail) for the spiral staircase inside its tower, the observatory at the Maya-Toltec site of Chichen Itza appears to be oriented toward a variety of celestial phenomena, viewed through its doors and windows. 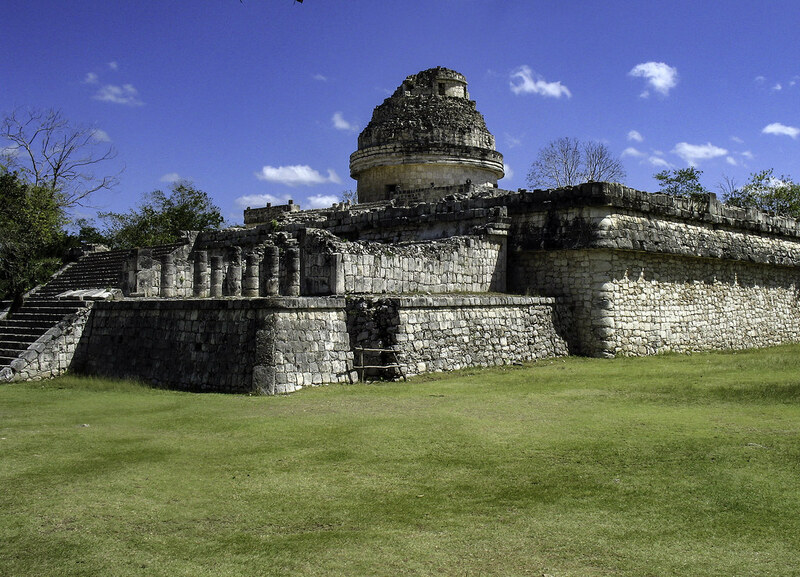 An unusual structure, with a round building on a square platform, it was built in the tenth century CE, late in the Classic Maya period (what’s called the Terminal Classic). The platform enables sky viewing over the surrounding vegetation. Its northeast–southwest axis is oriented to the summer solstice sunrise and the winter solstice sunset. The central tower has partly collapsed, making it difficult to determine all of the observatory’s astronomical aspects. It is clear, however, that it was designed to trace the movements of the planet Venus with particular care. Venus was associated with a war deity, and it possible that one of the uses of the observatory was the planning of military activities. A grand staircase at the front of the building is – uniquely among Chichen Itza buildings – oriented to 27.5 degrees north of west, the northern extreme of the path of Venus. 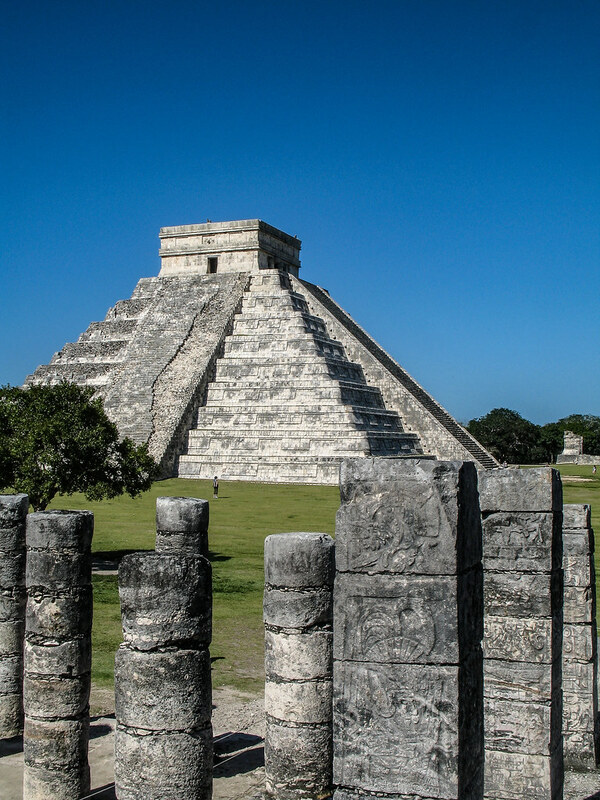 Among the great Maya cities, Chichen Itza has a particularly extensive range of architectural elements, to which the observatory certainly contributes. The city is thought to have had an unusually diverse population, perhaps contributing to its variety of architectural styles. 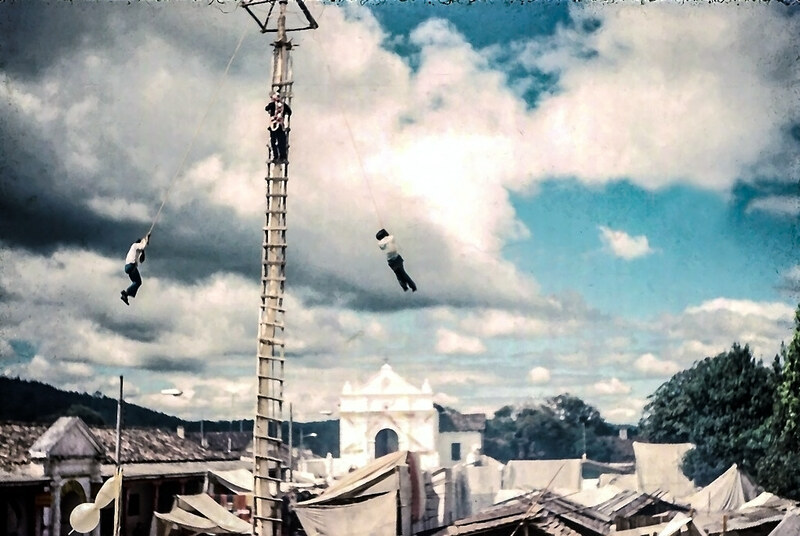 During the fiesta of Santo Tomas (Dec. 21), in Chichicastenango in the Guatemalan highlands, extremely tall pine poles are consecrated and erected in the plaza for the ceremony of the palo volador — the flying pole. Pole dancers climb in pairs to the top via platforms and ropes, and then they spin at the end of the ropes dizzyingly (and dangerously) down in great swooping circles. The ropes are attached to a frame that rotates at the top of the pole. In the pre-conquest period, the dance was said to be associated with the bird deity, Itzamna, and the recreation or regeneration of the world. A flute player stood on the top of the pole and played flute music that imitated the sound of birds singing. The “flying bird men’ represented the four directions. And spinning around the pole represented the regeneration of the world. Santo Tomas is Chichi’s patron saint, and with Christmas approaching this festival is one of the years biggest events, perhaps equaled only by the semana santa festivites in La Antigua. The festival attracts a very large crowd from all over the highlands. The rowdy, noisy, alcohol-fueled ceremony extends for several days around the saint’s official days. That day is marked by colorful processions, which include the baile de la conquista, the dance of the conquest, in which masked dancers portray the Spanish conquistados. It is the best market day of the year in Chichi, which is the prime highlands market town. I took this photo in 1975. 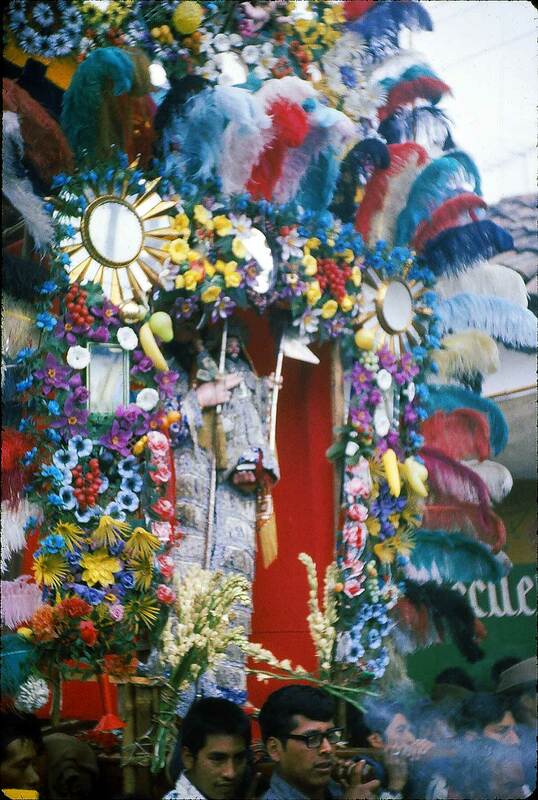 A festival in Chichicastenango, Dec. 1974. I remember my first arrival in Guatemala, back in the 1970s. I had been studying literature at the University of Wisconsin-Madison, when I got what seemed to be an opportunity to teach at the Universidad de San Carlos de Guatemala (in fact I ended up teaching at the Colegio Americano). As we traveled from the airport to our new home in Mixco Viejo — then a rural suburb of Guatemala City where cattle grazed in fields, but today well inside the city sprawl — I saw workers sweeping mounds of flower petals out of the roads. Wow, I thought, I’m not in Madtown any more. 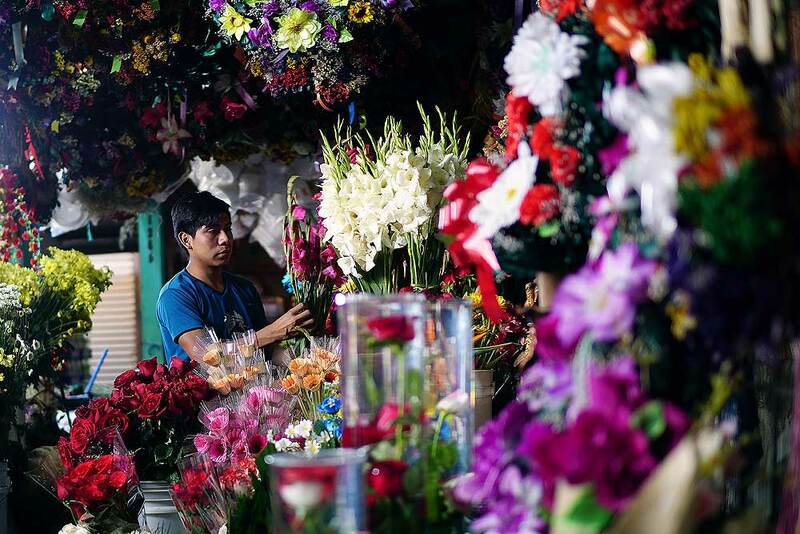 Flowers are so pervasive in Mesoamerica that it is easy to take them for granted. Surrounded by flowers. Guatemala. Photo from Lucía García González‘s photostream. Legends say that Quetzalcoatl sought to replace human sacrifice with offerings of flowers and butterflies. The Aztec gods Xochipilli, Macuilxochitl, and Xochiquetzal all had strong connections with flowers, and all were viewed as patrons of the arts. Morning glories seemed to offer visions of the realm of the flowers. Their seeds (called “Ololiuhqui” in Nahuatl) were consumed to produce hallucinogenic visions during festivals to Tezcatlipoca, the god of rulers, sorcerers, and warriors (this is the god whose name translates as “smoking mirror“). 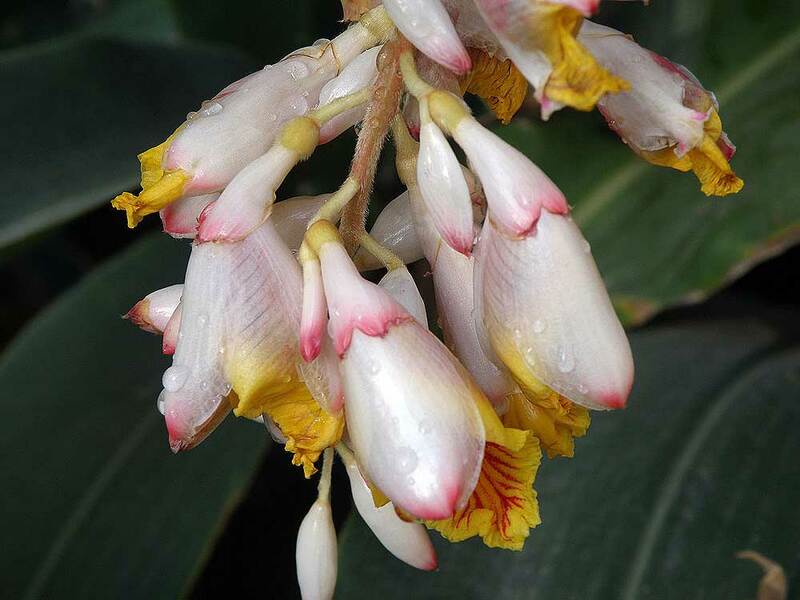 Some flowers offer connections to ancestors. Marigolds are a traditional offering on the Day of the Dead. Offerings of marigolds are mentioned in the Popul Vuh. 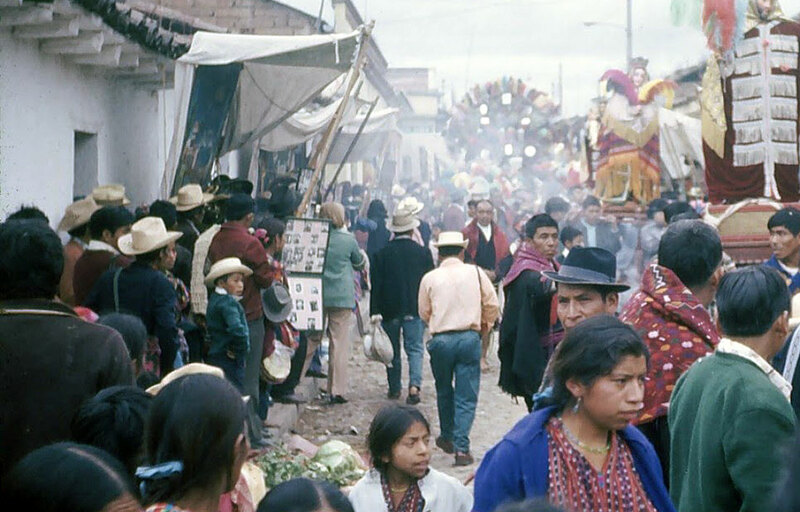 In 1992, Jane H. Hill posited the existence of a “Flower World” among Mesoamerican peoples, and this work has more recently been extended by her together with Kelley Hays-Gilpin in an essay in the Journal of Anthropological Research. According to this research, the Flower World is the spirit land the dead go to, “a beautiful chromatic world that includes not only flowers but also colorful birds, butterflies, and rainbows.” Flowers, these authors conclude, are metaphors of the heart and soul. 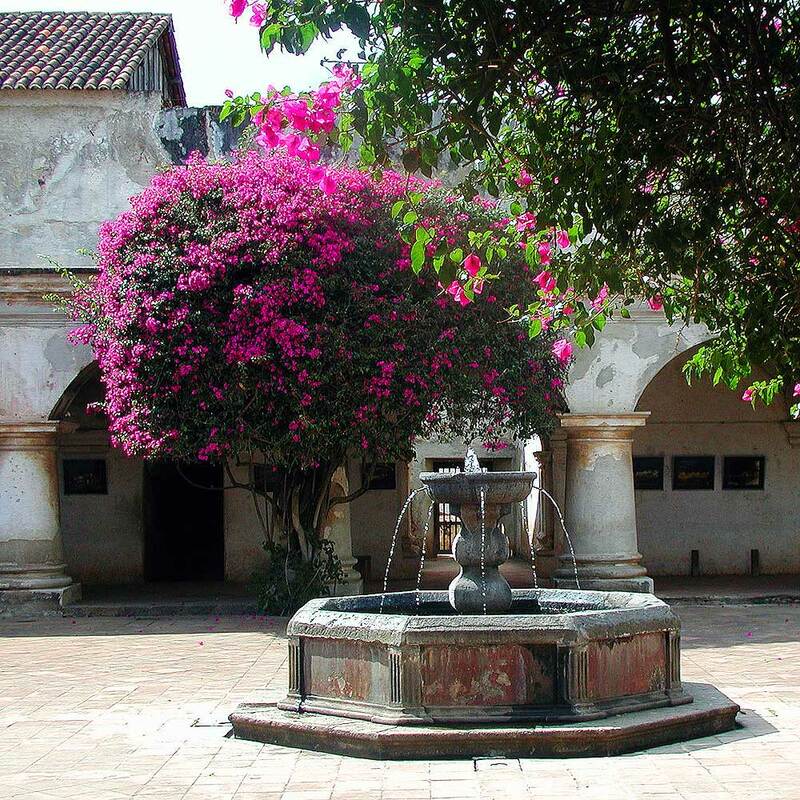 Certainly flowers are at the heart and soul of Mesoamerican culture. And flowers continue to be a major motif in contemporary Maya painting (as witness any number of paintings at Joseph Johnson’s excellent Arte Maya). A jacaranda tree, Antigua, Guatemala. Carved Mirror-Back with Hieroglyphs, late sixth century CE. Guatemala Lowlands, Early Classic Maya. Slate with cinnabar, 15.3 cm diam. Jay I. Kislak Foundation, Kislak PC 0132. 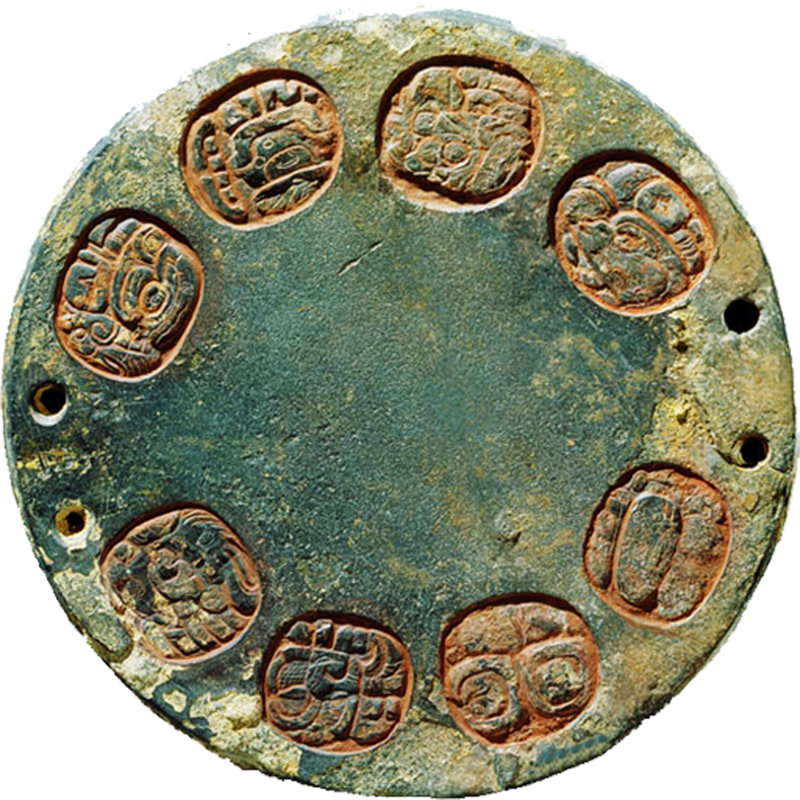 This royal mirror belonged to a ruler of the Maya Snake dynasty. This powerful dynasty controlled much of lowland Mesoamerica, including parts of current Guatemala, Belize, and Mexico during what archaeologists call the Classic Maya period. The Snake (or Kaanul) Dynasty — roughly contemporaneous with the dynasties between the Han and the Tang in China — probably represents the closest thing to a true Maya empire. Its history has only recently come into focus. 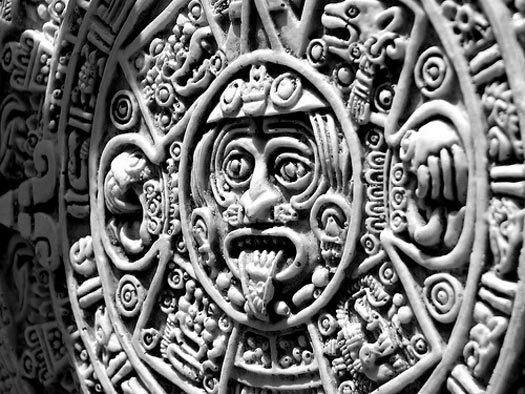 Maya culture is among the most persistent in the world. People sometimes say things like “The disappearance of Maya civilization remains something of a mystery.” But anyone who has lived in the land of the Maya knows the culture remains vibrant and strong. Yes, the Maya abandoned their jungle temples for political, cultural, environmental, and climatic reasons. But their culture persists. It doesn’t do this without adapting. The musical group Balam Ajpu shows how Maya musicians can incorporate assimilate trends without betraying their cultural heritage. (The band’s music is commonly called “Maya hiphop.” I don’t think “hiphop” is exactly right, but I have followed convention.) Following are some excerpts from articles about the group; follow the links for more. All of Balam Ajpu’s shows are that memorable. Far from a typical hip-hop recital, theirs is a ceremony, a rebellious spiritual gathering. Their lyrics are sincere tributes to the Mayan culture, Mother Nature, the forefathers and foremothers, the creators, the Earth, the stars, life. 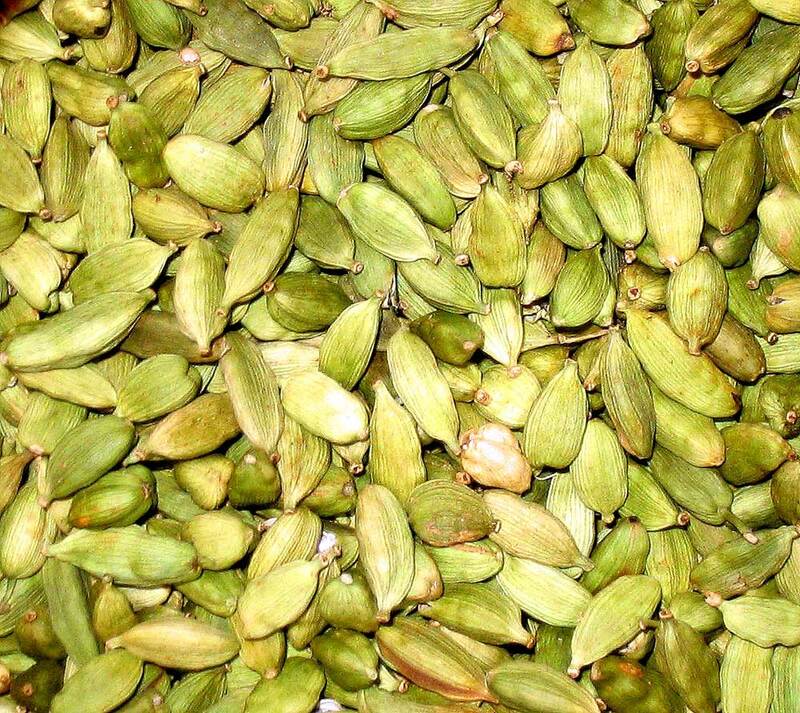 Their music: a fermented rendering of contemporary sounds. Marimbas, sonajas, turtle shells, hand-made drums, and birds chirping meet with acoustic guitars, basses, and violins to form slippery reggaes, smooth cumbias, and explosive Mayan raps. Balam Ajpu: Means Jaguar Warrior and represents duality, the opposites that complement each other, masculine and feminine energy. This group is made up of M.C.H.E., Tz’utu Kan, and Dr. Nativo, who crossed paths at Lake Atitlán…. Currently the three are part of the musical project Balam Ajpu, whose goal is to combine Mayan spirituality with art and to achieve a fusion between the indigenous Cosmovision, or worldview, and music. For the past five years, they have worked with girls and boys from the Atitlán region and Quetzaltenango through their school of Hip Hop Cosmovision, Casa Ajaw. They are part of the movement that is recovering the ancestral wisdom that the Conquest tried to silence, relying on ancient art and combining it with contemporary trends…. The musicians of Balam Ajpu refer to their creative work as “downloads” that they received through a series of ceremonies with spiritual guides like Venancio Morales. The lyrical content is based on a theological investigation in Tz’utujil. It evokes pre-Hispanic music, which it mixes with universal rhythms and influences. 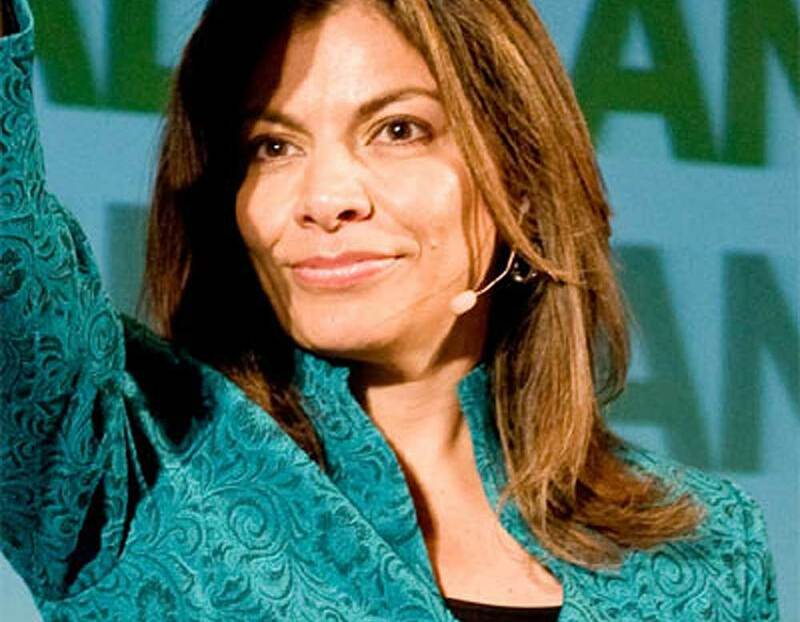 Women, Latin America, and the U.S.
Laura Chinchilla, 46th President of Costa Rica. It is a big step to have women as presidents, but in the patriarchal structure of power we have all inherited, very often women are still forced to prove that they are as “tough” as the toughest of men. A woman president who would defy the masculine model of power and infuse it with the feminine ethic of caring and real equality is still in the making. Although women as Latin American leaders have many challenges ahead, they have managed to get to the right place, and now they have to be daring enough to seize or declare that it is the right time. As a woman who has spent her life in Latin America, Belli has cred that I can never have. Still, I return to the issue of misogyny in U.S. politics and culture. Is the implication then that the role of the mother is comparatively devalued in the U.S.? Maybe to an extent, but I don’t think that can be the biggest part of the answer. Whatever the reason, our fear of powerful women is an embarrassment, and a factor that impedes our social and political progress. Over at Frisco Vista I recently posted about my new bitters, called Old Tom’s Maximon Mole Bitters. They will definitely spice up a cocktail. So what better time to have another listen to Lila Downs’s great “Cumbia del Mole”? When the pop singer Natalia Lafourcade stepped onto the stage of National Auditorium here last fall, it was a high point of a career that began more than 10 years ago, when she performed in grunge-inspired attire. But for this concert, Ms. Lafourcade eschewed the ripped jeans. Instead, she wore pants from a Mexican designer and a crown of red roses, paying homage to the artist Frida Kahlo. Halfway through the show, she was joined by a band playing jarocho, a style of folk music from Veracruz. In a country that is struggling with pressing social, economic and political challenges yet possesses a rich cultural heritage, many emerging artists and trendsetters no longer feel compelled to look abroad for inspiration. 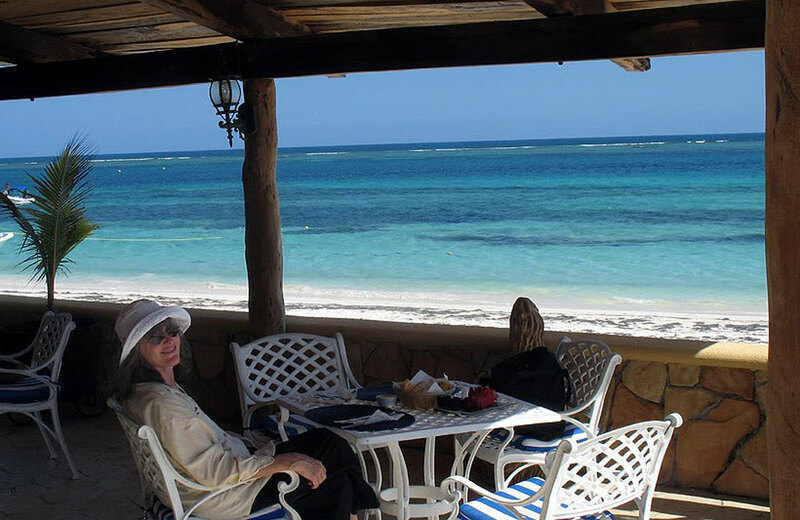 Lunch with Carol at Puerto Morelos. This post will be sticky in the “travel” category. To start with, here are some links that might be helpful. For now, many of these utilize the old Buried Mirror html, which is less responsive for mobile than the current look. Some are blog posts that may also appear below. These issues will get addressed. Ancient handprint at the ruins of Kabah. This post will be sticky in the “history” category. To start with, here are some links that might be helpful. For now, many of these utilize the old Buried Mirror html, which is less responsive for mobile than the current look. Some are blog posts that may also appear below. These issues will get addressed. This post will be sticky in the “culture” category. To start with, here are some links that might be helpful. For now, many of these utilize the old Buried Mirror html, which is less responsive for mobile than the current look. Some are blog posts that may also appear below. These issues will get addressed. 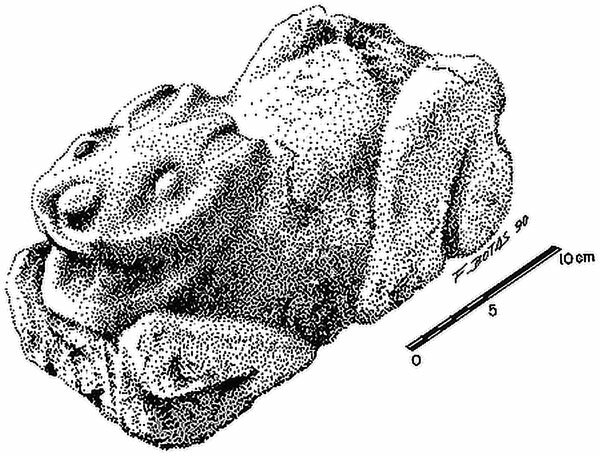 Illustration of stone rabbit sculpture from the Oztoyahualco 15B apartment compound. (Manzanilla ed.1993; drawing by Fernando Botas). http://bit.ly/2bEl0bZ. Via http://bit.ly/2bDOKEN. 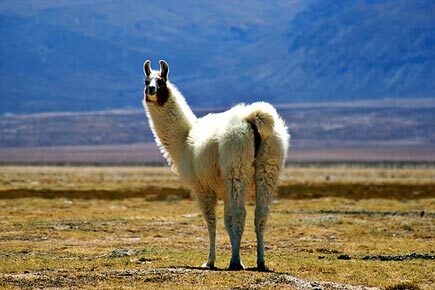 A team of researchers led by Andrew Somerville of the University of California San Diego, as reported by Cynthia Graber in Scientific American, have produced new evidence that ancient Mesoamericans raised animals for food. Traditionally it was felt that they did not engage in such acitivites, evidentally because researchers were looking for large food animals such as the cattle and pigs introduced by Westerners. Carbon isotope analysis provides evidence of the rabbit’s corn and cactus fruit diet, which is different from that of wild rabbits and suggests that they were raised domestically. Ruins of what appears to be a dedicated rabbit pen have been discovered. A rabbit statue was found at the site of the pen. The rabbit, still hunted but more often raised domestically, is popular in Central Mexico, where it is most often eaten adobado – marinated in a chile and spice rub – or estofado – stewed. The latter is a more suitable way of cooking larger rabbit, from three-and-a-half to four pounds. Smaller ones generally run from one-and-a-half to two pounds and can be prepared using shorter cooking methods such as frying or grilling. In either case, even domestically raised rabbit benefits a great deal from being marinated first. 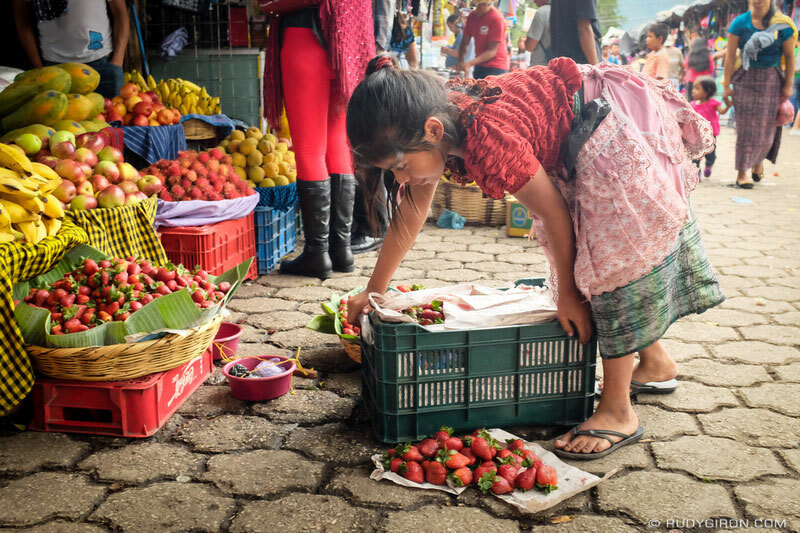 Young worker in market in Antigua, Guatemala. Photo copyright Rudy Giron, all rights reserved. It’s been four years since I’ve posted on this site. During those years I was focused on print projects (I published three books), but now I am renewing my web activities. When I thought of reviving this site, the first place I looked was Rudy Giron’s blog, Antigua Daily Photo, which is the source of this photo. I wanted to begin with Rudy, because he is a knowledgable resident of Antigua and an indefatigable blogger, as well as a talented photographer. Rudy’s blog now says that unauthorized use of his material is prohibited except for links and excerpts, so I am requesting permission. Please do not use his materials without authorization. One of the most troubling features of Guatemala and the Maya world in general is that it is so damned photogenic even when the situations the photography documents are problematic. I’ve seen this so many times. Here we have a beautiful photo of a young girl in a market, and the picturesque quality, if we’re not careful, can blind us to the harsh realities of child labor. 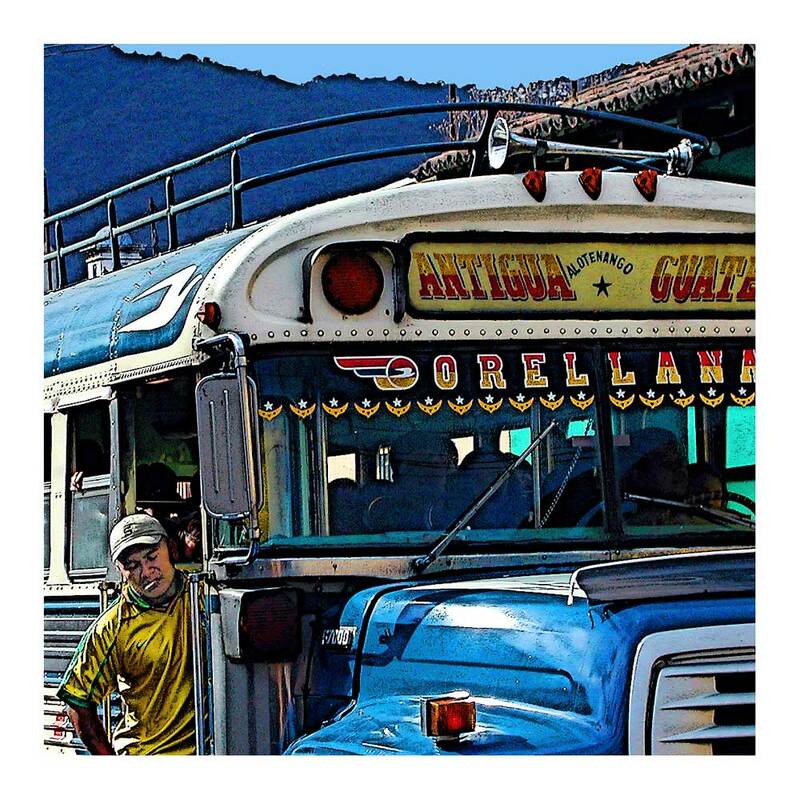 Rudy writes on his blog, “It breaks my heart to see SO MANY children working instead of being in school like they should if the laws were enforced in Guatemala.” He is quite right, and I urge you to visit his blog to learn more about Antigua, Guatemala, from an insider’s perspective. The portion of this painted ceramic drinking vessel that is shown in this image shows a well-turned- jaguarsporting a knotted scarf and a deer antler. He is a wayob’ — the companion spirit of a Maya ruler. Other wayob’ shown on the other sides of this vessel are a toad and a serpent (the young man at right is emerging from the serpent’s jaws). 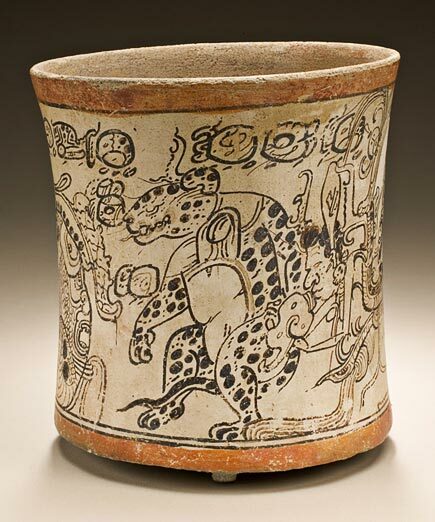 The vessel, from the southern Campeche area, is in the collections of the Los Angeles County Museum of Art. Drinking Vessel, 600-800 CE. Mexico, Southern Campeche. Ceramic with cream, red, and black slip, H: 5 3/8 in., D: 5 1/8 in. Los Angeles County Museum of Art, Gift of the 2006 Collectors Committee. 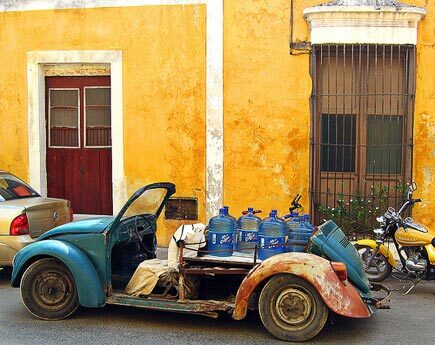 This photo from Izamal in the Mexican Yucatan comes from larry&flo’s photostream. This image of the Aztec calendar wheel — also known as the Stone of the Sun — that was excavated in the Zócalo (main square) in Mexico City comes from Drogdon’s photostream. The basalt stone is about twelve feet in diameter. It is now in the collections of the National Museum of Anthropology, Mexico City. 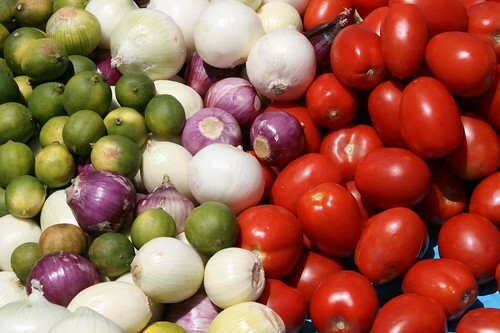 Christine Delsol identifies ten revolutionary Maya foods. Pretty good list. Read what she has to say here. 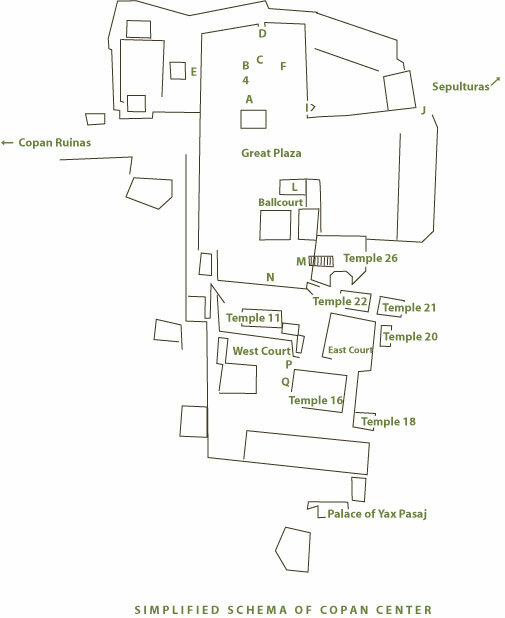 Incidents of virtual travel in Mesoamerica. A fine collection of Mexican colonial art : In Davenport, Iowa? San Francisco’s putative Mexican Museum gets $250,000 : Will it ever actual open? The Mixed Blessings of Mexican Dual Citizenship : Double military obligations anyone? Guatemala stops ex-officials from leaving country : But did it do the same for the cocaine? I hope to return to more regular blogging soon. We might as well start with our regular feature, Photo Wednesday. 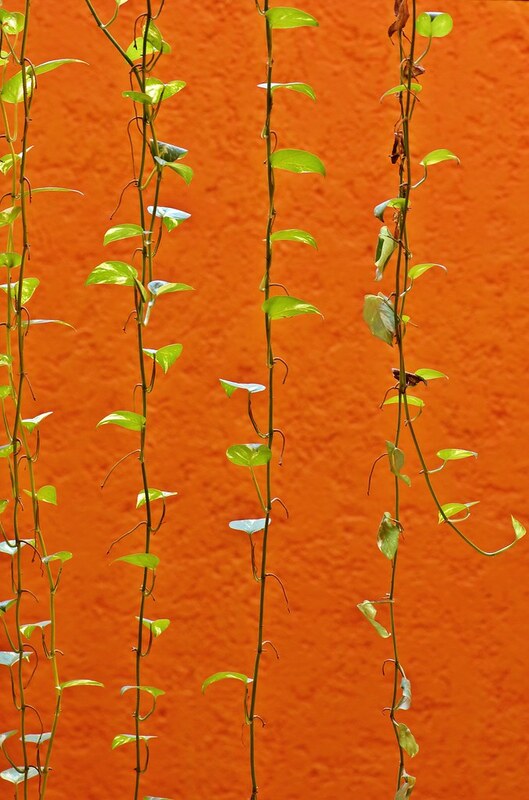 This image of hammocks against a bright wall comes from CasaDeQueso’s photostream. CasaDeQueso says that the hammocks were for sale at a roadside souvenir shop, near Coba, Quintana Roo, Mexico. 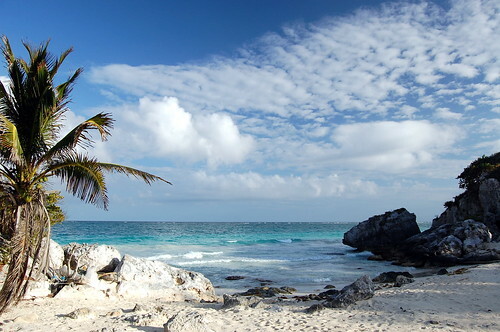 This photo of the Caribbean near the ancient Maya city of Tulum is from mdanys’ photostream. 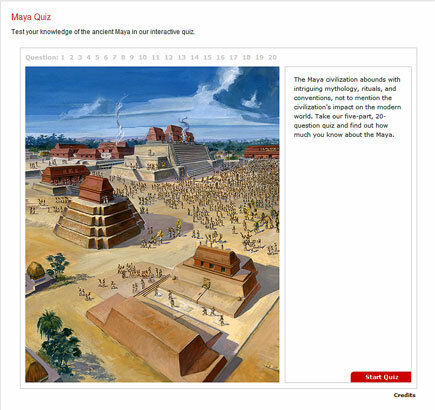 Incidents of virtual travel in Mesoamerica and the Maya world. While U.S. attention has rightly been focused on Mexico’s drug wars – with high-profile trips by President Obama and Secretary of State Hillary Clinton before this weekend’s Summit of the Americas – Mexico’s southern neighbor is in far more serious danger of becoming a failed state. Reeling from gangs, corruption and pervasive poverty, Guatemala now faces well-armed, well-financed drug cartels. 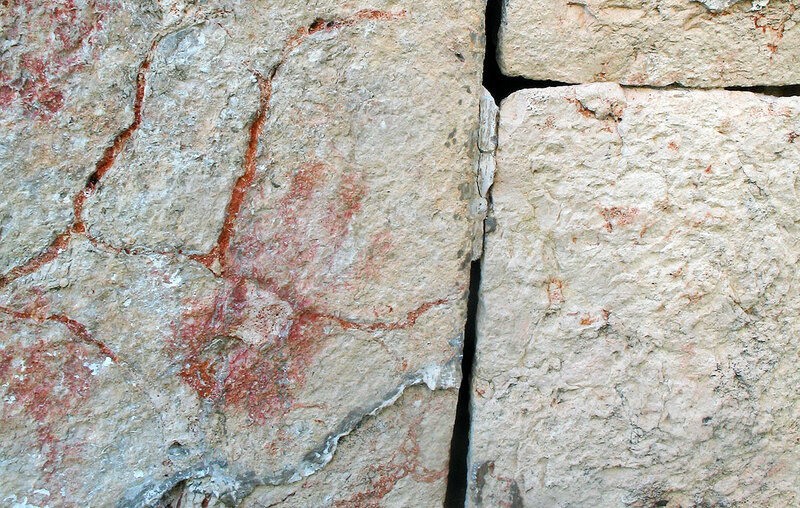 A pair of monumental (26-foot) stucco panels have been discovered at the important classic Maya site of El Mirador in the Peten by a team led by Richard Hansen of Idaho State University. The figures in the panels appear to represent the heros twins of the Maya creation myth. This is clearly an important find. The panels can be dated to the Late Preclassic period, from about 300 BCE to a little after the beginning of the common era.